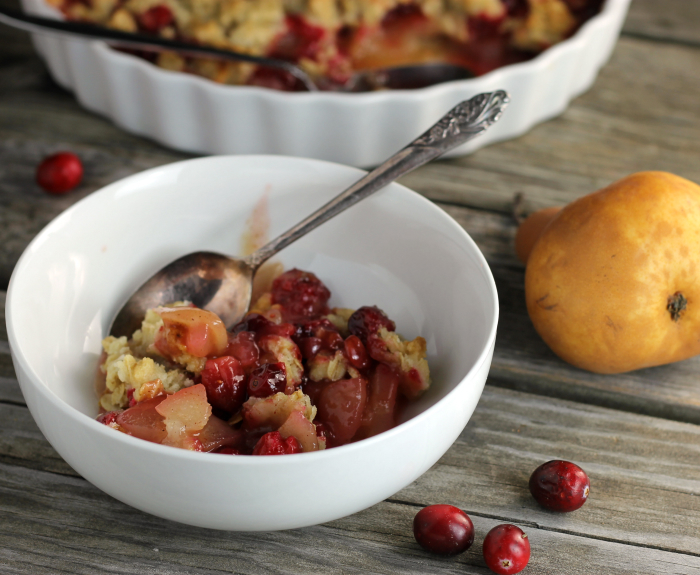 Pear Cranberry Crumble - Words of Deliciousness Pear and cranberry crumble a lovely combination of sweet and tart in this yummy dessert. 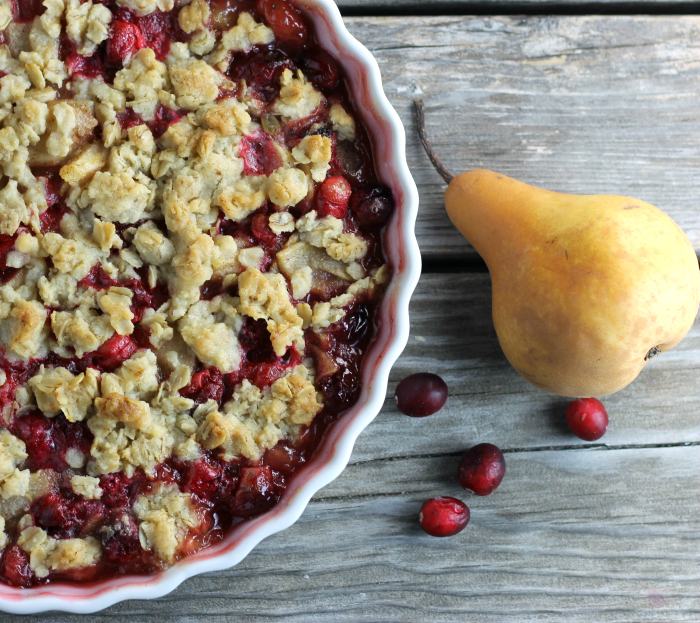 Pear cranberry crumble the perfect dessert for Thanksgiving or maybe even Christmas. But you know what I am ready for? Yep, that’s right… Thanksgiving. It will be here in a couple of days. Which means family, food and more along with time off from work. Which brings me to my post today. I love pie and I am a big fan of the pie crust. I never leave a bite of it behind when I am eating a piece of pie, but let’s face it, sometimes it is just nice to have the filling and the topping. 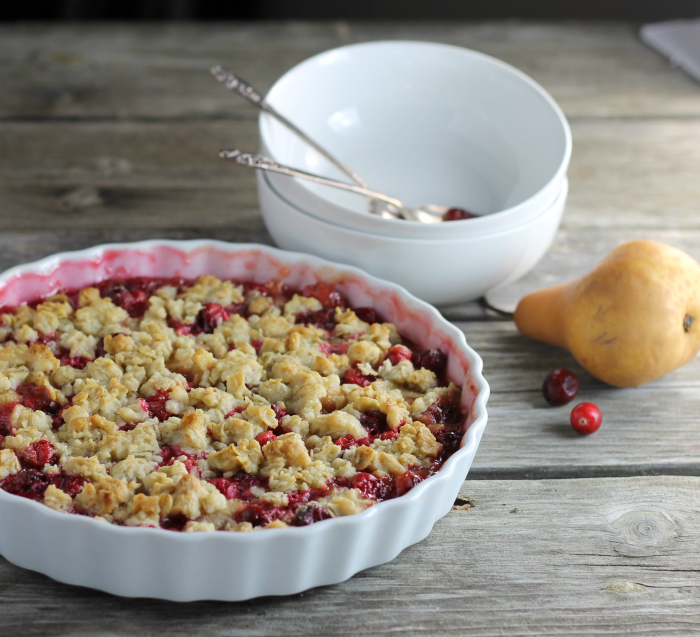 Such as this crumble, easy peasy, but so yummy. I love mixing up flavors when I am baking or even cooking, but I love mixing up different fruits together. I was trying to decide what to combine with some cranberries that I have sitting in the freezer, I was thinking about apples, but then pears came to mind. As you know I have been enjoying baking with pears this fall. 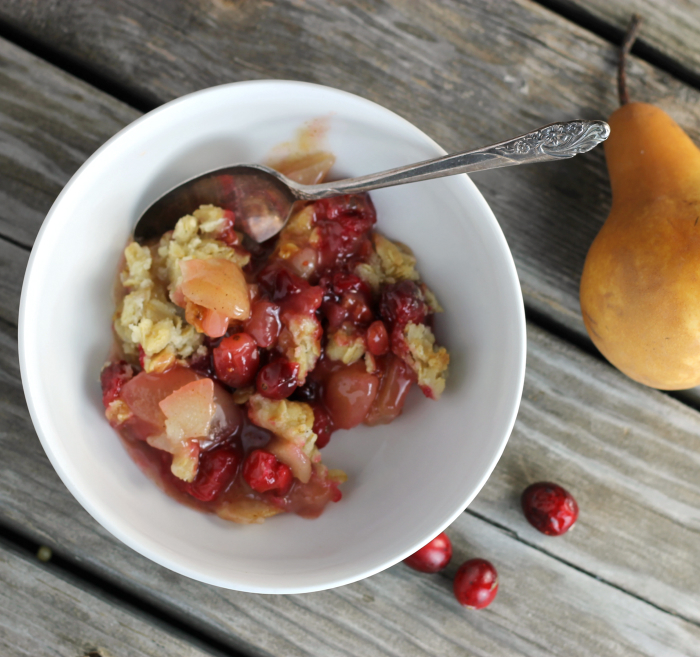 I absolutely love the sweetness of the pears with the tart tanginess of the cranberries. The sweet crumble made this one tasty dessert. Preheat oven to 375 degrees F. Butter a 9-inch baking dish. In a large bowl combine the sliced pears, cranberries, sugar, flour, cinnamon, and orange juice. Toss together until well combined. Pour the combined ingredients into the prepared baking dish and set aside. For the topping combine the sugar, flour and oats, mix until well combined. Add the softened butter and by fork or by hand mix until well combined. Sprinkle the topping over the fruit mixture. Place in the preheat oven for 35 to 40 minutes or until mixture is bubbling and the topping is golden brown. This looks so good! I don’t use cranberries in baking very much but I should, love the look of this! Dawn this look absolutely beautiful!! I love it!! What a gorgeous dessert for the Thanksgiving table! The combo of pear and cranberries sounds absolutely delicious Dawn! I’m a crust lover too but with that topping I wouldn’t miss it. Happy Thanksgiving! Crumbles are the best! 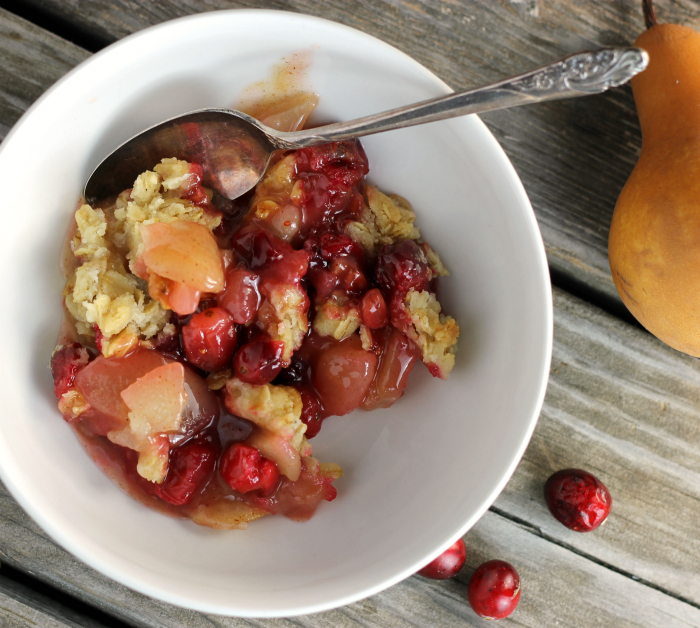 Love the combo of cranberry and pears — so tasty. Haven’t tried that combo, but I will! Happy Thanksgiving!